Alert readers will know this wine was tasted a while back as part of a broader look at 2010 SBS blends. 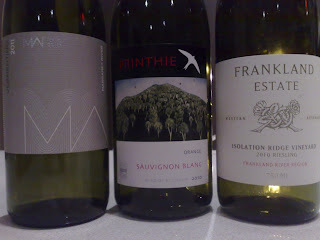 The wine performed pretty well in that line-up. But ranking wines in tasting line-ups or shows is a dangerous thing, providing only one side of the equation quite unrelated to the others – including the real experience of real people drinking wine for pleasure. That's what we were doing. 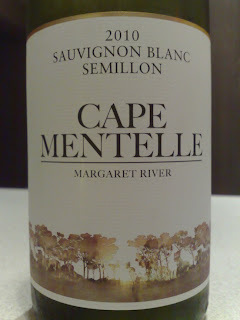 The Cape Mentelle SBS sits at the upper echelon of the price range for these styles of wine and wears the burden of the label’s reputation, meaning it has to be good every year to command the price they’re asking. Sure, there’ll be the usual robots who buy this wine every year so they can have a piece of Cape Mentelle on the table at dinner parties, but there’s no doubt you would find equally excellent examples of SSB/SBS from Margaret River at much lower prices. That said, this is a very good wine. A colour of clean, fresh straw. Grassy and minerally chalk hits the nose up front, some grapefruit tang and pithy lemon. There’s a cool crispness, like un-ripe peach, and a line of gooseberry. 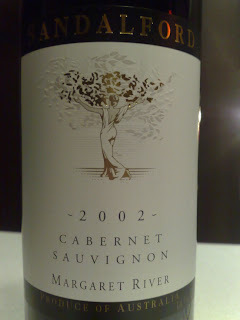 Subtle, stylish background oak, and there’s smokiness, spice and some green sweet-pea aromas too. The palate is creamy yet bursts with flavour mid-palate. Tangy grapefruit again, lime, juicy citrus – quite frankly mouthwatering and begging for some spicy Asian fare to tease out it's restrained power. The grassy, herbal characters continue here, plus the chalky minerality, but it all adds to the complexity – a simple complexity if that’s the right wording, because after all, these wine styles need punch and delicacy in equal measure, and this wine nails it. Crisp, without appearing to be, and great length. There's oak again which helps draw out the palate and add creamy texture. Good wine. It’s on the serious side – the lean and keen and mean side – but that makes it sensational with food. We did Thai green curry and Thai fish salad. Getting the food/wine matching right is key to allowing the wine to express it’s best, and vice versa. The underlying sweetness of the SBS burst forth when paired with the chilli and rich creamy coconut curry. 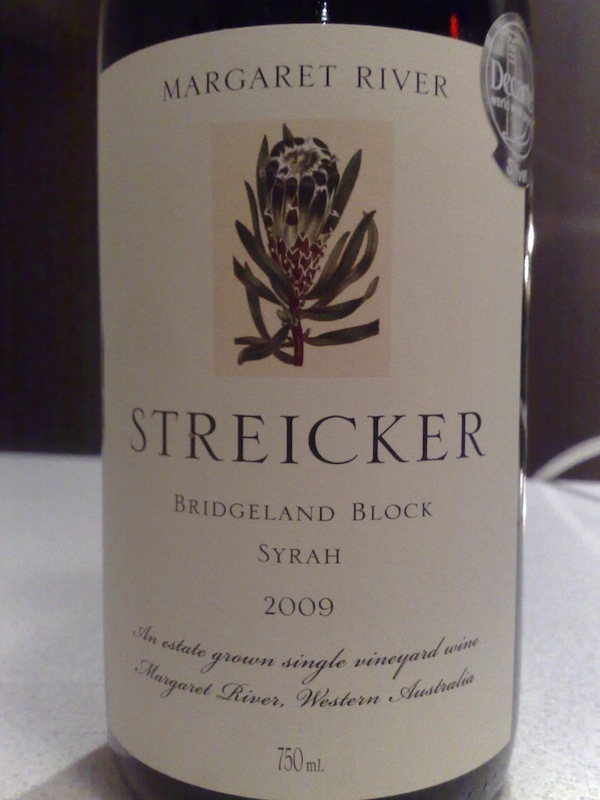 Value: $28 at cellar door – it’s right up there and you’re paying for ‘label’ here, but it’s a very stylish drop. Producer: Cape Mentelle – www.capementelle.com.au. 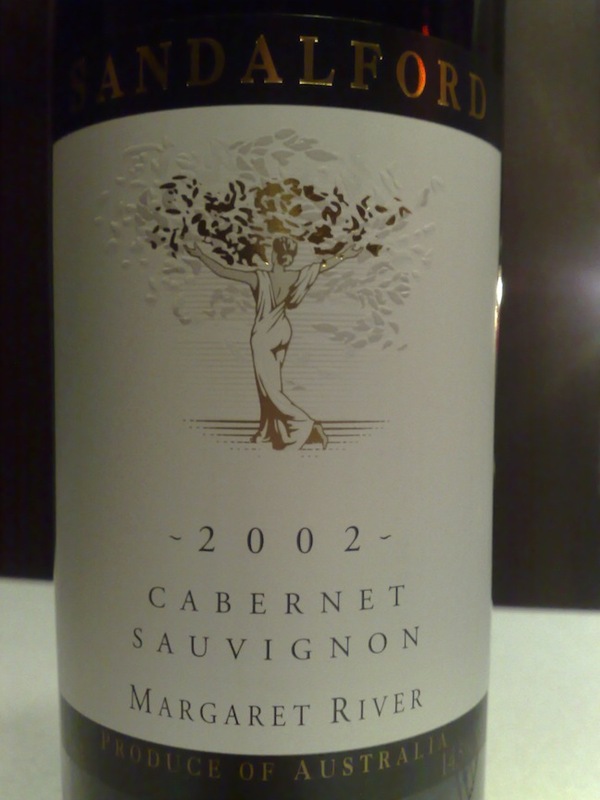 Established in 1970 by David Hohnen and friends, the winery is considered one of the elite producers of Margaret River. Hohnen later went on to develop Cloudy Bay in New Zealand and then sold his winery interests to the massive LVMH Group. He now runs pigs and sheep while keeping his toe in the wine industry by way of McHenry Hohnen Vintners. Site: Gravelly loam and some sandy soils over a clay base (the majority of the fruit comes from Cape Mentelle's southern vineyards, specifically Chapman Brook). Winemaking: 54% Sauvignon, 46% Semillon. Approx 15% fermented in French and American oak. Four months on lees. Another Margaret River red found it’s way onto the bench this week – a shiraz this time – the discreet mistress variety in this cabernet-centric, cool-climate region Western Australia. 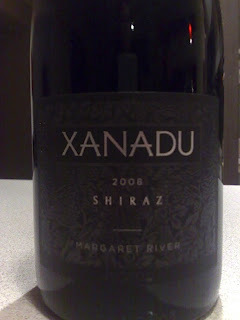 Xanadu have been around since 1977, and wine devotees will remember well the public listing, the rapid increase in production, the awkward management that led to the temporary demise of the beloved label. And the resurrection under the reins of the Rathbone family. But... to the wine. Dark red, muddy sort-of colour. A not-very-traditional meaty aroma greeted, with smoky char, burnt cherry, or sweet tar? A light prickle for the senses. More recognisable characters of blackberry and red-fruits, carob, black olive and cinnamon quill. There’s a purple-ness about this wine. Purple for me describes a freshness and richness, a youth of sorts, a vibrancy. The oak looks silky, but it’s definitely on show. Actually, it ebbs and flows, but is always precise. There’s a little green/white pepper. The muddiness = less varietal character, but no less interesting. The palate strikes me as creamy, yet still murky, and the finish is drying a little. Medium weight, it is bassy and the forest floor flavours dominate. But I also see redcurrants, plum and raspberry – quite a sweet palate really, but dense. 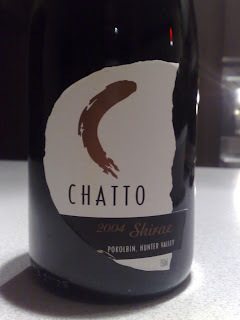 Smoky BBQ char again, tannins firmish – will need some food (duly supplied in the form of osso bucco). On the warm side maybe, but this wine opens beautifully in the glass and shows some seductive shapes and flavours, while at the same time feels secretive and restrained. Yes, the finish is drying but the food sorted that out. Really enjoyed this over two nights. It’s got some mystery, and in many ways lacks varietal definition, but who gives a toss really. It’s a bloody nice drink. It charms even when you lift the glass, and your eyes absorb the muddy colour before it reaches your nose and lips. X-Factor? Yeah, there’s that. As is often the case, the food really allowed this wine to show it’s best. Good stuff. Value: A $29 retail price is most comfortable. Producer: Xanadu Wines – www.xanaduwines.com. Established in 1977 by the Lagan family, doctors who migrated from Ireland in 1968. Rapid growth and a public listing in the mid-90’s saw the spectacular collapse of the company. The current owners, the Rathbones, bought the assets of the business in 2005 and seem to be doing a sterling job of rebuilding the brand. Winemaker – Glenn Goodall. Site: Roughly half the fruit is estate grown from the Stevens Road vineyard in central Margaret River, and the rest from growers. No specific site info available. Winemaking: Partial whole berry fermentation, combination of tank and French oak maturation. A dash of Viognier is in here too. Vintage: A classic vintage. 2008 was an excellent year in the region, following on from the superb 2007. The 08’s tended to have a little more structure in both whites and reds – a little firmer and robust, without losing that general elegance of Margs. Probably the 08's will outlive the 07's. A little break from the blog due to work demands, but here I am back on my feet with a left-field Coonawarra Riesling. A quickie follows..
Colour of light straw. A punchy, lemony fresh nose hits you from the outset, some steely-ness and chalky limestone minerality. Phenolics showing a little but in good check. Sweet aromatics of rosewater, some lime rind, musk and then the fruit spectrum opens up to peach and quince/pear. There’s some bassy notes yet the wine still dances lightly across the nose. The palate is juicy lemon – a real fruit salad opens up – tropical even. It’s creamy, not crunchy – no piercing acidity here. Flavours of lychee, dragon-fruit, peach, green apple, pear and quince again. It straddles the wire between the high delicate and the low bass notes triumphantly. Is there some sweetness on the palate? Dunno. But if there’s some residual, it’s well handled. The palate lingers nicely, and despite a low 11% alcohol it has good carry. It’s a goodie. 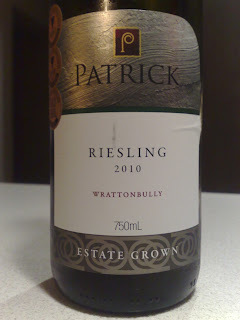 I’m not overly familiar with Wrattonbully Riesling but from this example it looks like the variety handles itself well in the region, if not overshadowed by the reds. Value: $26 – not outrageous, but up there. This wine is a double trophy winner at the Limestone Coast Wine Show, so it has some notches in it’s belt. Producer: Patrick Of Coonawarra – www.patrickofcoonawarra.com.au – Owner/Winemaker Patrick Tocaciu. 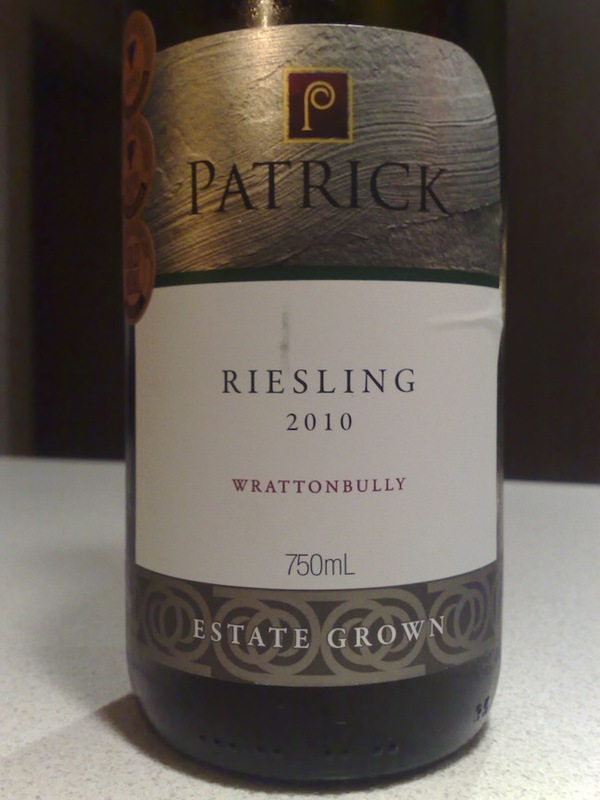 Region: Wrattonbully, a relatively new wine region situated between Padthaway and Coonawarra. Site: Rich limestone, terra rossa.